The tension between security and business productivity has never been so acute. To operate at peak performance, organizations need workers to access enterprise resources in more places and in more ways -but the locations, type sof workers and access methods has pushed traditional security strategies to the breaking point. The consumerization of IT adds further complexity as a diverse mix of laptops, smartphones and tablets enter the environment, including both enterprise-owned devices and those purchased by workers. What's needed is a new security layer-one that makes it possible to manage risk more effectively. 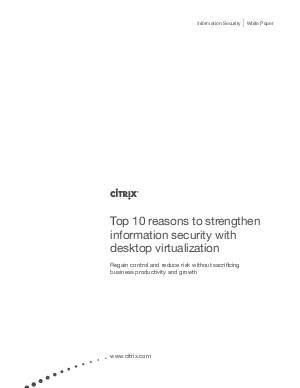 Learn the top 10 reasons to strengthen information security with desktop virtualization.